Like what you see here? 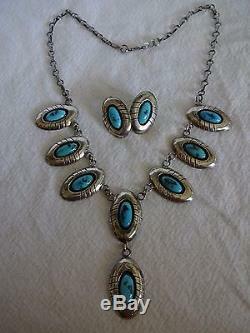 VINTAGE NAVAJO NECKLACE & EARRING SET. DESCRIPTION: This exquisite set features "pillow" shadowbox settings containing oval. 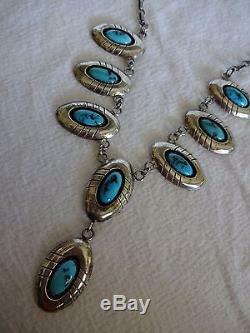 High blue turquoise, secure in scalloped bezel. 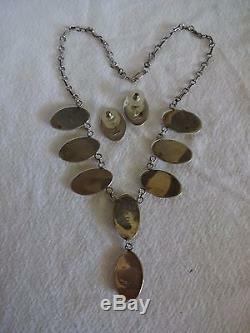 This is a very comfortable any day demi parure. 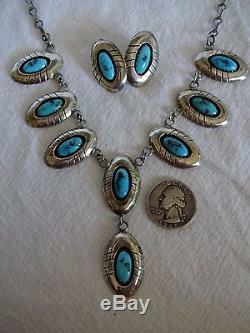 This set will be a treasured addition to your collection of fine vintage Native American jewelry. 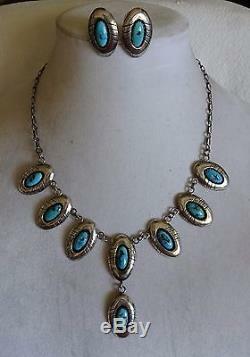 MEASUREMENTS: Necklace measures 19" Center pendant measures 1 3/8" x 7/8 Center pendant turquoise cabochon measures 14mm x 7mm. Earrings measure 1 1/8" x 3/4". 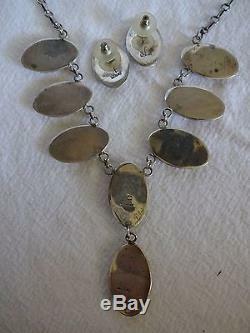 WEIGHT: Necklace weighs 40.7 grams. 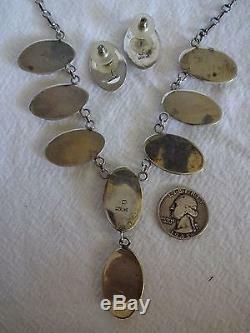 Earrings weighs 8.2 grams. Total weight: 48.9 grams. SIGNED: P for Platero (Navajo). 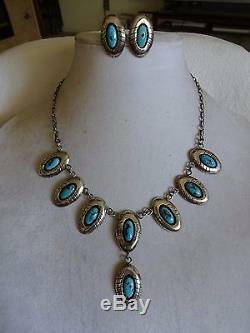 The item "Signed Vintage NAVAJO Sterling Silver Shadowbox TURQUOISE Necklace Earrings SET" is in sale since Thursday, August 10, 2017.